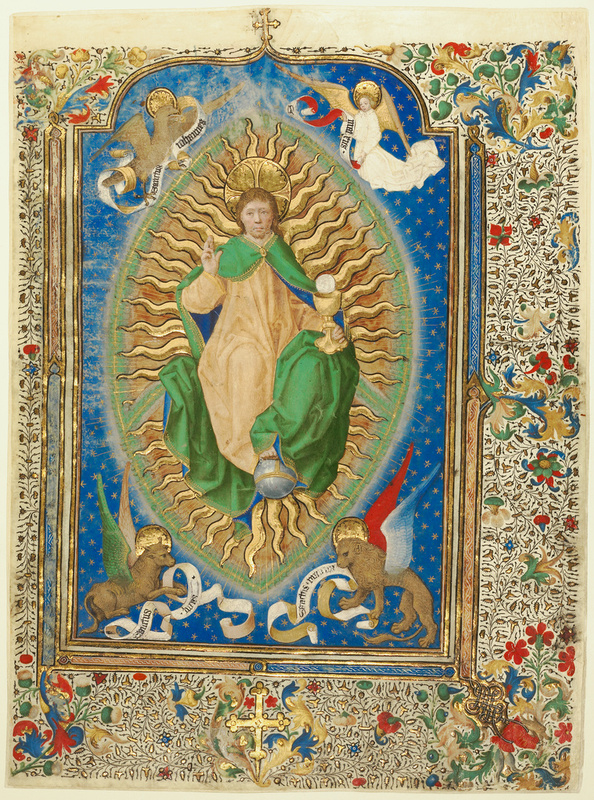 Dressed in flowing robes of ocher and brilliant green, the monumental form of Christ dominates this leaf from a missal. The miniature prefaced the opening of the text for the Canon of the Mass, during which the priest prepares bread and wine for the Eucharist. The composition follows the traditional model for Christ in Majesty, with Christ seated on the arc of heaven and within a mandorla. He holds a chalice over which the host hovers, a reference to the celebration of the Eucharist. The stylized rays of light that emanate from Christ's form create a direct contrast to the subtle modeling of the folds of his robes and sensitively painted hands and face. The eagle, man, lion, and ox placed in the corners are symbols of the four evangelists, John, Matthew, Mark, and Luke, respectively. Each holds a scroll inscribed with the corresponding saint's name. This leaf is one of the finest paintings by Antoine de Lonhy, who was active in the Savoy region of France in the 1400s. The leaf that faced it in the original manuscript depicts the Crucifixion and is now in Prague.